Thanks to a tip from GrubGrade, we know that Baskin-Robbins is doing $1.31 scoops on the 31st day of the month this year (so the 31st of January, March, May, July, August, October, and December). 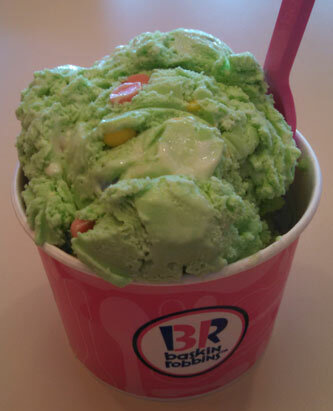 It seems like a great excuse to try the very green "Easter Egg Hunt" ice cream that Baskin-Robbins launched last year. I take my first bite and I know that I'm in trouble. I've got a pretty high sugar tolerance, but I am about to be overwhelmed, and that doesn't happen often. I was expecting a somewhat tame base with hits of sugar swirl here and there, but no, there is little variation to the full throttle sugar rush found in every bite. It's "white chocolate" in a very loose sense of the word. It's more like those weird little candy corn hershey bars. There's even a somewhat similar gritty texture to it (not as gritty as snacknado, but this is definitely not silky smooth either). The plentiful blue, yellow, and pink eggs do add a nice fun factor, but their flavor just amplifies the overly sweet nature of the base. They aren't crunchy sugar bits, it's more of confectionery sugary stuff that's solid while still being somewhat soft. It's just more candy grit and I'm slowing down with each successive bite of them. This rarely happens, but I did not finish my ice cream. The last third is sitting in the freezer. I thought the ride back to work would get the juices flowing so I could finish up but all it did was make me realize how terrible overwhelming this flavor is. This one is meant for kids, plain and simple, and even then, it's not guaranteed they will like it. Let's put it another way. I was so overwhelmed that I almost stopped for a nice hot bowl of chicken noodle soup just to reset my system. Final Thought: The server always asks if you want to try something first and I really wish I had on this one. It's just that if I set my mind on reviewing something, I want to really review it, not just a tiny sample of it. Live and learn I guess. On Second Scoop: In Baskin-Robbins defense, this ice cream has held up remarkably well for the 6 days it just spent in the back of the work freezer. In my defense, there is a whole lot of sweetness going on here. A few bites of this is more than enough. When you are eating it, there is some temptation to continue (like I am right now) because it is a fairly unique flavor and the eggs are a neat touch (and I'm hungry), but I still can't recommend this flavor. If you want to try it, that's fine... just get a small... and split it with someone... or a few people.... oh yeah, there's the sugar weirdness kicking in again after I finished eating.... I'm getting too old for this apparently. Does Easter Egg Hunt come out today? Thought that was as of April 1. Gotta get some of that if it's out. @TTB: don't do it!! preparing to update this post with a review momentarily. Tuesdays are already $1 scoop days at Baskin-Robbins. I tried the crème brulee flavor today and thought it was meh. It was weird with the flavor and the crunchy sugar bits. They should had done a sherbet flavor like berry sherbet or sorbet. 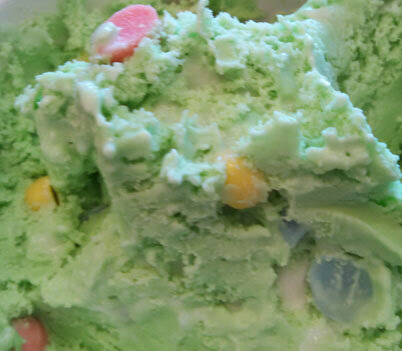 Bring back the watermelon sherbet that is my #1 flavor. I hate actual watermelon but the watermelon sherbet is the best thing. @Meredith: Ummmm, maybe a regional thing? I was the first $1.31 scoop of the day and they were talking about telling the other cashiers. How disappointing. Baskin Robbins has really been dropping the ball on their flavor of the month. Yup the rainbow sherbet. It always good. I bet you're little girl would have liked this! I know your little boy has a food allergy but can he enjoy the ice cream you bring home? This one definitely seems like a kid flavor! So if this is the flavor of the month, then what is the new Crème Brûlée one? @TTB: no no, Easter Egg Hunt is just seasonal, Creme Brulee is the April flavor of the month. The Easter Egg Hunt is so good! It was like Easter in a cup, I was not disappointed at all. Im sad that it's seasonal, Please never get rid of this one!